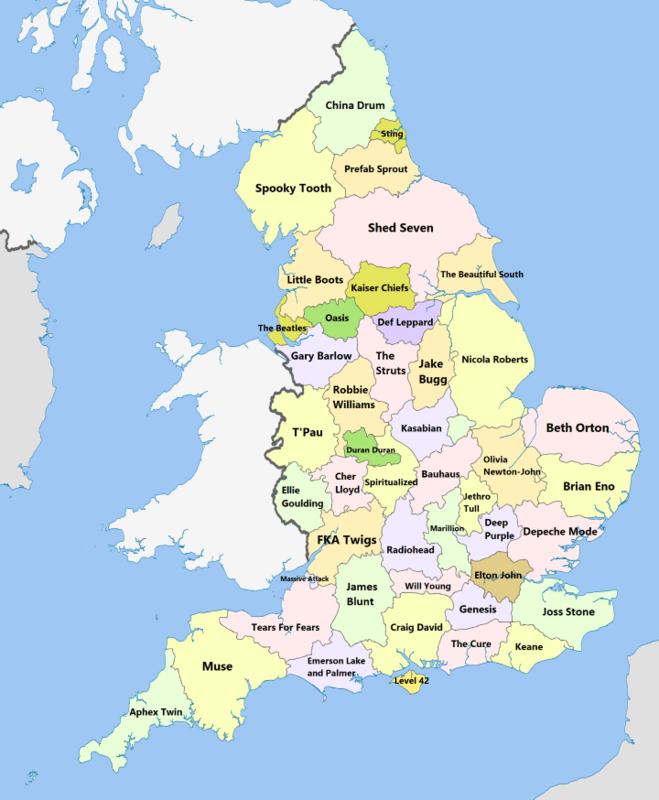 The map above shows the best selling singer, musical artist or band from each of England’s 48 ceremonial counties. The criteria seems to be where someone has grown up rather than necessarily where they were born. And if you’re curious we’ve previously published previous maps about the Best Selling Singer Or Band From Each London Borough and Best Selling Singer, Music Artist or Band From Each US State. Joss Stone is from Devon. I’m guessing Kate Bush would be the biggest artist from Kent! Rolling Stones are surely biggest selling from Kent. They were from Dartford. Joss Stone was BORN in Dover but yeh grew up in Devon, whereas Muse were formed in Devon but not born there! Ed Sheeran is from Framlingham in Suffolk (but wasn’t born there). Hi there. Jethro Tull we’re from Blackpool which according to your map has moved to a commutable distance to London. Pet Shop Boys also from Blackpool. Heatwave’s (and Michael Jackson collaborator) Rod Temperton was from Humberstone in North Lincs and surely outsold Nicola Bloody Roberts? This map is definitely not correct, in fact it’s bizarre. For example, where are The Rolling Stones?! You’d think they should be in London, but they’re probably in the Cayman Islands. The Dorset one is incorrect – ELP were a London act. Only Greg was from Dorset, the other two were from Yorkshire and Birmingham. Supergroups by definitions surely don’t count – that’s like saying The Monkees were Manchester’s top-selling act. I think Dorset should actually be PJ Harvey. Also, if the criteria is where someone grew up, Nicola Roberts is from Cheshire, she was only born in Lincolnshire. The Lincolnshire one should probably really be Matthews Southern Comfort. I don’t think you understand this map. They’re all from counties where another artist has sold more records than them. And about Europe Rock artists ? No one from Rutland? At all? Pretty much the only musician to have spent time in Rutland is Jay Kay of Jamiroquai, who went to school there. Can you buy this map? If so where and how much please? Yeah Oliva Newton John is an Aussie for a start and wheres Black Sabbath and the Rolling Stones? Olivia Newton-John was born in Cambridge and lived there until she was 6. Pink Floyd for Cambridgeshire, Led Zeppelin for Warwickshire surely? No one from Rutland? Ha ha what about The Rutles? Humberside. What about the Housemartins. Beautiful South and Fatboy Slim. That’s the East Riding of Yorkshire, not Humberside. That was abolished in 1996. Surely the Arctic Monkeys have outsold Shed Seven? Or have i got my geography wrong?